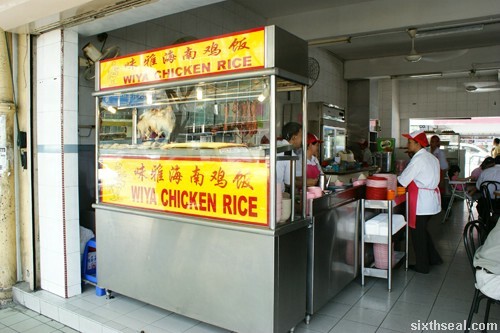 Wiya Chicken Rice is the oldest and most established nasi ayam outlet in Kota Kinabalu. I remember eating their pyramid shaped chicken rice with gusto, savoring every single delicious grain of rice and morsel of chicken when I first got out of rehab a couple of years back. I was determined to patronize this outlet again when I went to KK last weekend. We took a cab down to Segama for the chicken rice (BTW, KK taxis rips you off when you depart from a nice resort, going back is always cheaper) coz I REALLY wanted to eat it during the first day we arrived in KK. Wiya chicken rice was just as I remembered it – packed and busy, with heaps of people waiting for their acclaimed pyramid shaped chicken rice. Actually, the sole USP of the place is their rice which wouldn’t look out of place in Egypt. It’s actually very simple – they have a pyramid shaped scoop. 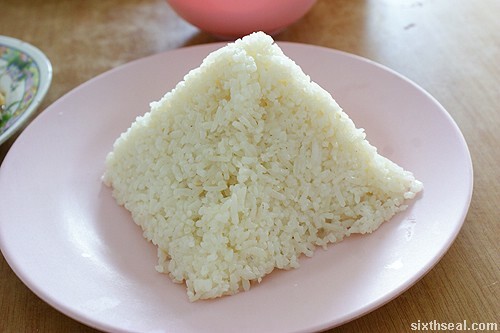 I’m not sure what it does for the taste, or whether the pyramid shape gives it mystical properties, but aesthetically it looks good and the rice is just like I remembered it – soft, fluffy and full of oily chicken essence so you can taste the rice. 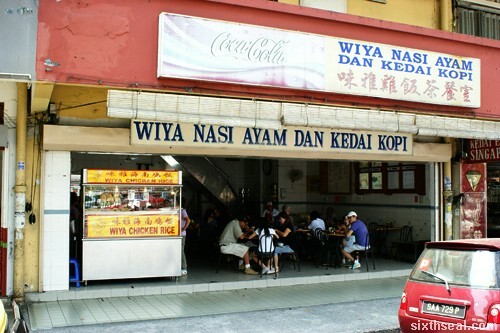 The chilli sauce at Wiya Chicken Rice can hold its own against most other similar establishments too. 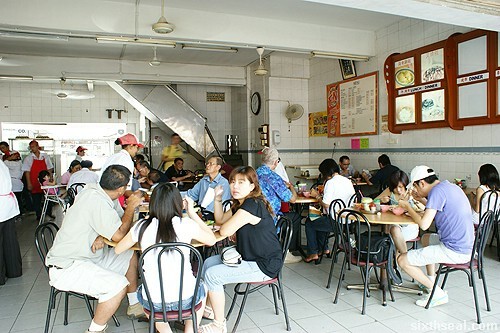 We also ordered a plate of char siew – take my advice and avoid this. 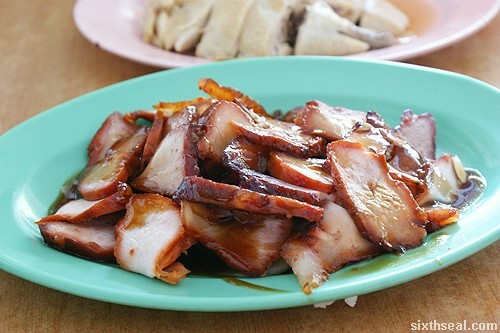 In the words of Jerine: “This char siew doesn’t have any taste to it”. It’s true. It’s bland and dry. Just pass on that, you’ll thank me for it. 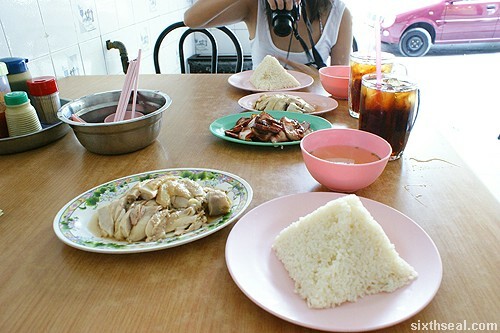 However, their chicken is pretty succulent and the flavorful rice more than makes up for the char siew disaster. 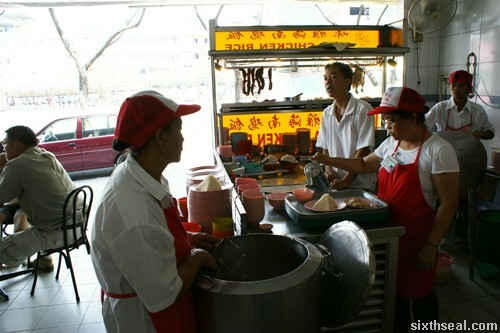 It costs RM 20.40 for the both of us inclusive of drinks.